If you have gastritis, or inflammation of the stomach lining, a warm mug of lemongrass tea could be a relaxing antidote to stomach distress and acid indigestion. Native to tropical regions of Africa and Asia, lemongrass is used as a culinary herb and a medicinal tea for stomachache, fever and insomnia. Ask your physician if lemongrass is a suitable herb for you. Gastritis can be traced to stress, an excess of stomach acid and spicy foods, among other factors. Eating food at very hot or cold temperatures can also cause gastritis, writes medical herbalist David Hoffman in his 2000 book, “Healthy Digestion.” Gastritis and its associated condition, heartburn, can be painful and alarming. Symptoms of heartburn sometimes mimic those of a heart attack, including shortness of breath and a fiery pain running from your chest to your neck and throat area. If you have difficulty breathing, seek emergency assistance from a medical care provider. Lemongrass tea is a traditional remedy to treat gastrointestinal problems, according to the Memorial Sloan-Kettering Cancer Center. Additionally, it is a nervine, a substance that can dissipate stress and nervous tension, primary culprits underlying gastritis. In fact, a Brazilian infusion for insomnia and nerves is abafado, or lemongrass tea. Biochemist and professor of cancer research Bharat B. Aggarwal, author of the 2011 volume “Healing Spices,” cites one laboratory study from Brazil in which lemongrass extract demonstrated an ability to relieve nervousness in laboratory animals. Consult a qualified health-care professional if your stomach condition is severe or persistent. If you enjoy hot and sour soup or other Asian foods, the scent of crushed lemongrass is probably familiar to you. The herb is chopped and added to salads and soups. Cooks also grind lemongrass into a paste that flavors curries. Adding fresh lemongrass to your foods is another way to benefit from the herb's therapeutic constituents. Lemongrass tea and the fresh herb are sold at Latino and Asian grocery stores, sometimes under its Indonesian name, sereh. Memorial Sloan-Kettering Cancer Center cautions against using lemongrass with chemotherapy medications. Lemongrass is high in antioxidants, which could hamper the effectiveness of the chemotherapeutic drug. If you are pregnant, it is best to give lemongrass a wide berth, according to Memorial Sloan-Kettering Cancer Center, as it contains myrcene and citral, constituents that induced birth defects in laboratory animals. 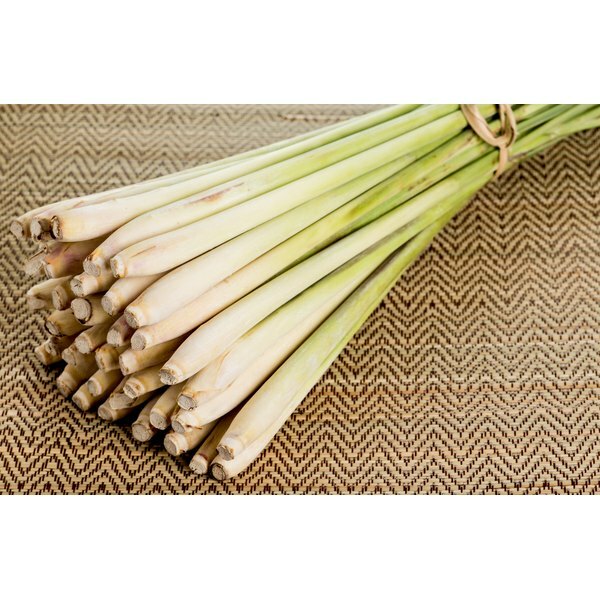 Negative reactions to lemongrass include thirst, increased urination, lethargy and loss of balance. Can Drinking Ginger Tea Help With Anxiety?